WTF? 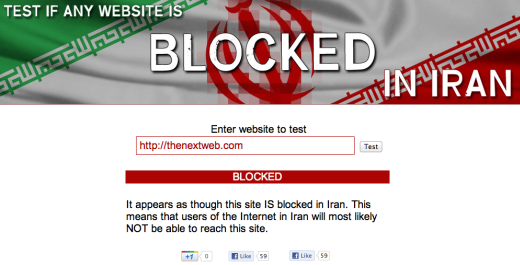 Why is TNW blocked in Iran? For reasons we’re not entirely sure of, it turns out that The Next Web itself is one of the latest sites to fall prey to government censorship. As it turns out, the government of Iran is apparently nonplussed with some of our tech coverage as Iranian readers can no longer access the site without the use of a proxy. It’s possible to check if a site has been blocked by the Iranian authorities using the site, Blocked in Iran, and testing The Next Web we discovered we are in fact blocked, joining the ranks of Twitter, YouTube, Facebook, MySpace, Tumblr, WordPress, LiveJournal, The Guardian and many many more sites. Testing many other news, business and tech sites, we found that most of them had not been blocked, and we can only guess as to what it was that triggered the block. Our coverage of the Iranian government’s consistent efforts to control its citizens Internet access, and thwart efforts made by others to grant them access, as well as their attempts to block access to certain sites they deem threatening, or even cripple Internet speeds, may have had a little something to do with the move. We most recently reported that Iran’s filtering system had faltered briefly, but the filter is very much back in place, blocking not only social networking, blogging and community sites, but even blocking access to VPNs which would make it easier for Iranian residents to get online. All jokes aside, this is an extremely serious matter. Having experienced firsthand a government’s attempt to cut its citizens off not only from certain sites, but from the Internet as a whole, it is wholeheartedly disappointing to find that when you attempt to shed light on the suffocating censorship tactics in use by governments like that of Iran, you become the subject of that very same censorship.